Your business or project can save significantly on staffing and rent by establishing your team in Ho Chi Minh (locally known as Saigon). Of course, the process of choosing a location for your office and executing the decision can be overwhelming. As a city of almost 10m people, in an area looking at housing 20m people by 2020, there are many locations you might consider. We meet a lot of first-time visitors who need help to get their operations started in Vietnam. We’ve prepared a simple map of the districts that are most often at the top of the list. District 1 and District 3 can be considered the downtown area of Saigon. These districts are home to many of the major banks, corporate offices and embassies. Rents are highest in these areas and property can be difficult to acquire, but you should know that there is significant variation from a premium location like Bitexco and the secluded ‘local’ alleys of the downtown area. There are also many coworking spaces in the downtown area. These might also be a viable shorter-term option while you establish your company or team. 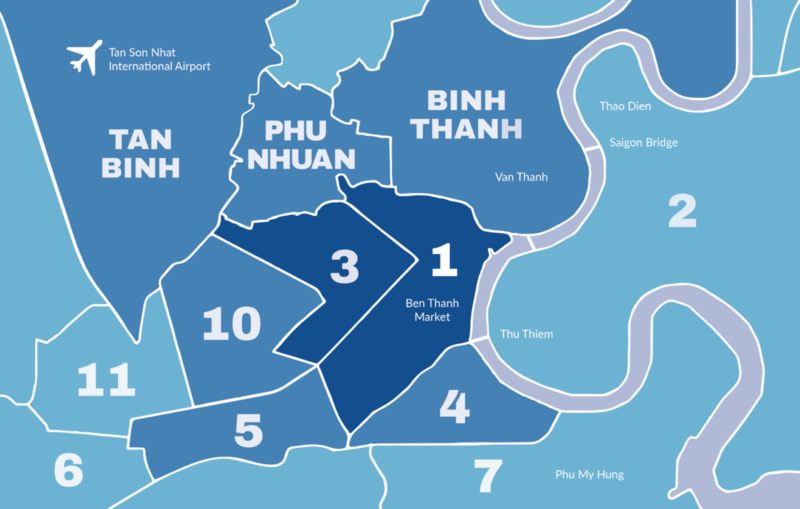 The inner suburbs include District 4, 5, 10, Tan Binh, Phu Nhuan and Binh Thanh. Rents in these areas are generally more affordable and the office is likely to be located closer to the homes of your local employees. District 5 and 10 are traditional suburbs, with narrow buildings and very busy, vibrant street life. Over a small river to the south, District 4 is the site of the old port and some major redevelopments. Over a small river to the north is Tan Binh and Phu Nhuan, newer suburbs which are located close to Tan Son Nhat airport. These inner districts can be great for international companies on a modest budget. The outer districts include older areas such as District 6, 8, 11 and others. These are relatively traditional but slightly lower density than District 5 and 10. Rents are significantly cheaper, but this can come at an unseen cost to your employee brand: international company located in these area will not be seen to have the prestige or reputation as companies located more centrally. Be aware of this when choosing an outer district location. However, some of the outer districts are new, particularly District 7 and District 2. Specific areas within these districts are very popular with expats: Phu My Hung in District 7 and Thao Dien in District 2. These areas are very modern, with high-rise apartment towers, premium villas / compounds and wide leafy streets. There is a lot of construction occurring in these areas at present. It is also important to note that some of the outer districts are undergoing significant change. For example, District 9 is located to the north east of the downtown area. Home to the tech park that houses various international giants, including Intel, this district has received significant investment over recent years and will soon be connected by rail infrastructure. Major developments are also planned for Thu Duc and Cu Chi: while these areas do not yet have the vibrancy of the more central districts, it is certainly worth keeping an eye on them in the future. 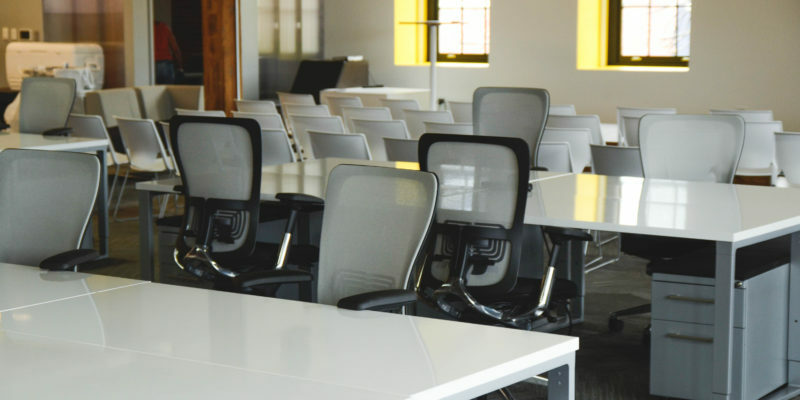 What Should You Expect When Renting An Office? There is good news: wherever you rent, you can expect that talented employees can be found nearby, the internet connection will be pretty good, power supply will not be a problem (unlike previous times) and nearby coffee shops will be abundant. Travel times will be acceptable, particularly when you think about the challenges in other cities such as Bangkok, Jakarta or Manila. However, office rental will be an important early step for your operations in Vietnam and it can be a hurdle for new arrivals. In general, you should be aware that the property market moves quickly and can be much more complicated than that found in the USA, Australia, Sweden or other high-income economies. Quoted prices will change, and listed properties will not always be available. Trusted local contacts are invaluable. Rental prices can range from $5 to $35 per square meter, and even higher for AAA properties. Renting a commercial property is typically a 2 year commitment and requires a deposit of 3 months rent. Properties need to be leased to a company registered in Vietnam or an individual. Concessions will often be given for fit-out periods. On-site parking should be available, perhaps at a marginal additional monthly cost per motorbike/car. Its important to remember that coworking spaces and private offices also provide an option in Saigon. Many startups are averse to the traditional rental terms of a commercial office, and the city is now responding with more options for this tier of the market. An Exciting And Ever-Changing City! Of course, the list of locations provided above isn’t exhaustive. Saigon is a dynamic city that is changing at an incredible pace, and Vietnam’s ability to identify and complete major projects should never be underestimated. Infrastucture is improving, airline routes are connecting to more places than ever, and foreign-owned companies are increasingly easier to establish and operate. In the Asian Century, Saigon undeniably has a major role to play! If you’d like to talk further about an office location or starting your operations here in Vietnam, reach out to us today. We offer a free consultation to understand your requirements and put you on the right path.